Chick Can Do | Have a giggle at my expense. I can laugh at myself. So enjoy today…and learn about life, dogs, chickens, and how grace really matters. Have a giggle at my expense. I can laugh at myself. So enjoy today…and learn about life, dogs, chickens, and how grace really matters. Chick & Her Roo: It’s REAL Life, too. 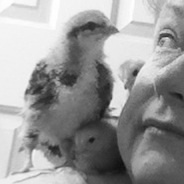 After three months of fostering 2 little chicks, it was time for them to go to their forever home with my friend Jean. My heart was sad but I know that she will treasure them and keep them safe, but wait…that’s not how the day started. Yawning, I turned the shower on but the phone rang and off went the shower. I need you. I need Bill. My goose was attacked and she’s laying in the yard fighting for her life. She’s still alive. Please send Bill to help me. I can’t handle this on my own. Now Bill had just closed his eyes for a much deserved afternoon nap. Putting my hand on his shoulder, I whispered that our friend needed him. He didn’t pause although he did sigh when I told him why she needed him. Changing his clothes, he asked what she wanted for him to do. That, I could not answer. This was not his favorite kind of call to take, as you may imagine. Waiting for him to return, I decided to start preparing the casseroles for several families that I had promised. As I was shredding the chicken, I was looking out my kitchen window and see the irony as my live chickens ran around the back yard. Over an hour later, Bill returned home. She wanted me to save the goose. Because this had happened yesterday, the goose had flies surrounding it…she was in pain, so I “put her down”. I dug the hole and she is at rest now. (By the way, by “her”, he was referring to the goose. You probably knew that, but…) The other 45 minutes was spent talking to her and comforting her. Oh, and I told her that we may want 1 male and 1 female goose. Looking around, I tried to locate my husband…I could not understand what he was saying. This is the same man that says we have enough. But they are geese that warn the chickens of predators. They will stay with the chickens. Before he went to lay back down for his nap, I told him our other friend, who is retired and couldn’t start with the baby chicks, was coming to pick up the little ones we’d had for 3 months – the ones we had fostered for her. No doubt that Bill was as attached to them as I was. I realize this sounds ridiculous, but oh…so…true. We went out to the pen to visit with them when our friend arrived. We chased them down and put them in a box. I ran back into the house, as she was one of the casserole recipients. Again, I found it ironic as I placed her chicken casserole in the front seat of her car while HER beautiful chickens were in the backseat. Adam, I’m so glad for you. What does that mean? Ms. Summer, You may pick them up on Wednesday because school is out on Thursday. Bill doesn’t seem to be bothered by any of this…not one of these things. I wonder if being married to me has him used to being on your toes at all times. He acts as if all of this is natural. The one thing I know is this. I know this is love. As I sit and reflect on this single day in my life, I understand that I need to thank God for the big and the small things every single day. Besides that, if I don’t thank him in the good times as well as the bad, especially today, I may not have time after Wednesday when we include a dozen chicks and 2 adolescent geese…geese. You know that those geese will probably head from Virginia to Texas to my friends in the winter! And, you’re welcome! I guess I need to look into baby pools? I don’t have a pond except for the one in front of the house. It might hold tadpoles. I can’t see it holding even one goose. They are going to need water. Right? Oh man…I guess I’ll need to join another FB group, where we pray about someone’s goose that may or may not make it because of some stupid nature creature that attacked it. Don’t get me wrong, we prayed for a sick rooster last summer that deserved the prayers to God; BUT I noticed that he had 75,000 followers. Yes. Yes, he did. The truth is that in having the animals it helps to keep me active. Left to my own devices, I might let this arthritis, the kind that has my joints degenerating at a rapid pace and that tries to strangle my everyday activity, actually strangle me to a chair. There is a reason and a season for every single one of the animals inside and outside of our house. God knew before I was born what I would need and he provides. He provided for me prior to my own birth. Now this day…this day that I am telling you about didn’t end yet. We soon left after receiving a call from another neighbor down the road to please come to their house, now. Without explanation, we put our shoes on and left the house. After arriving there, Bill met with the husband and I went inside and met with the wife. We prayed together for what this family is encountering. No details needed except that I praise God for this day. I praise him because he never lets me out of his sight. He knows what I need. He knows who needs him. Am I perfect? No. Am I a Christian, even when people say “and you call yourself a Christian”? Yes. I am his daughter. I am his imperfect, chosen, loveable and tired daughter; but I get up and receive new joy every morning. I have never been happier. This entire day reminds me of how much I love God. He is the Word. He sacrificed everything for me. So I believe I can spend time with him everyday. Most of all, I’m a believer. Are you in a season of life you don’t understand? Do you ask why things happen? Lets talk about it. Lets find him in the details of what’s happening in your life. There’s nothing more exhilarating or satisfying than knowing there is a plan – which the Holy Spirit moves in your life. There is no such thing as perfect. If you haven’t watched the news lately, I don’t recommend that you start doing it now. It’s devastating to hear about the savagery done everywhere in the world. It’s heartbreaking to see children, women, and men killed and for what? People are being murdered for being Christian, for being Jewish, for being black, for being white, for being homosexual, for being a woman, for being a man…for not agreeing with the people that are killing people. Not only is there death from human beings but, there are also natural disasters that have killed and are displacing individuals from their homes. If I see hashtags with #________livesmatter it infuriates me because all lives matter. Gang mentality is all around us, whether it be a gang of people who kill randomly for religious sake in the Middle East, the United Kingdom or the United States or people who kill to gain membership anywhere they will be accepted. People are lost. People have lost respect for others…for life. You’re probably thinking why is this childless, chicken owner discussing this? People have lost compassion….consumed with the daily routine. Homes and families are broken and no one is talking about a fix for any of this. We seem to be in defense mode and not offense mode. We can’t rely on government to “fix” this. How can this be remedied unless we do something…unless we talk about it? It seems that the lost will fall in line with anyone who offers them a place, a home….anything for a place, any place for a sense of belonging, even if it’s not a healthy environment. That’s why this childless, chicken owner is discussing this. Recently I watched an episode on television about a successful owner of a chain of fitness facilities. As he spoke about his business it resonated to me as a human being with values and respect on this earth. Get ready. Challenge yourself everyday. Create a new breed of thinking. Use simple functional movements. Do 25 repetitions at a time. Core strength is important. Don’t try to grow a business, but do the right things for the right reasons. Drop in on affiliates at random times. Training videos are free. There is no recruiting necessary because people want to win. Stay in your chair and you’ll be sure to be hurt. Now, you may think that by adding this it’s about being physically fit. While that’s an important part of life, this is about being ready for the challenge of life outside of our comfort zone. It’s time to get radical about loving on purpose on this earth. Get radical about how you’re going to do this. This is more than learning a scripture here and there. It’s more than attending a church building. This is larger than catch phrases. It means not comparing ourselves with each other. It’s looking for each opportunity to share compassion and a love we are so freely given, even when we don’t “feel” like it. Feelings aren’t facts, by the way. You do have a purpose. Have you a clue what your purpose is while you’re here but for a short time? It matters not what your age. You may make a difference in someone’s life. In fact, you may save a life because of your age and wisdom. What is stopping you from showing compassion to someone who needs you? Is it time? Do you think you can’t do it? You don’t feel like it? Well, wake up. You don’t have to know what your purpose is to show compassion or to love one another. Get a little uncomfortable. Get out of your chair or surely you will be lonely and you’re only hurting yourself. Personally, I know what gifts I have been given. I use them as much as possible and I give God the glory for all of those gifts he loaned me. (You have these too!) When I met a woman six years ago who was a thorn in my side, I would try to avoid her at all costs. She showed up at my home at the most inappropriate times. She is also raising her granddaughter and she’d drop her at my home…unexpectedly. Two years ago this child’s mother died of a drug overdose. My attitude changed. All of the sudden, I began to tutor her for school. Word got out that I was helping her and now, there are three little girls with no mom or dad. God knew what I needed and he knew what they needed. Did I know this was part of my purpose? Not really. I didn’t really want to do it. I was uncomfortable because I wasn’t the best student myself. BUT GOD has me studying and being loved by these little hearts. I believe they benefit. They seem to look forward to our meetings. And, darn it, we have them around sometimes when we aren’t doing schoolwork. So my purpose has been to mentor these angels, and it comes at a time when physically I am at my weakest. I don’t believe that is a mistake. love, acceptance, redemption, followers, likers, and they often find it in the wrong places. Sometimes they seem to be the most unlovable people we meet, when truly they are just hurt or hurting people. The last place they want to be is in a church building to be judged. The last place they want to be is where they aren’t accepted for who they are right now. How can we change ourselves to create a door for them to know God…to know His love and to accept his love and gift of eternal life? How may their life change, if we simply get out of our comfort zone? Are we consciously waking each day to awaken the Holy Spirit inside each one of us who is his child? Someone invited Naeem Fazal to church. He had recently moved to the United States as a Muslim. He encapsulates his journey to Christianity in his book “Ex-Muslim”. His parents rejected him. They were not happy, as you may imagine. Years later his parents moved from Kuwait to the United States and live with him. They scorned him. They did their daily prayers and he is ridiculed daily in his own home. His mother often asked him questions about ‘his Jesus”. He admits that it is through this challenge that he has learned more and become stronger in his faith in God, as a Christian. In fact, the Holy Spirit moves him, he admits. This isn’t a debate about faith and or works. This is meant to cause a commotion in your core. Do you fight that direction from above or that direction from your gut? What voice do you give to those in need? What does the Bible speak to you after you pray? Do you hear from the Holy Spirit? Do you discuss your challenges with a fellow believer? How do you discern what is from the Holy Spirit? What challenges you to move…to get out of that chair? What will you do? In fact, God is our provider. As a Christian, God will renew us and transform us…He always provides. He never promised a life without problems. I have had my share of problems. (Thank you for reminding me…I’ve seen good come from it and I’ve learned from it! Thank you for asking!) Transformation and provision from God may not look like what we think. If you didn’t have a car, you’d likely find a ride. If you didn’t have a phone, you would find a way to communicate or you may get a phone later. You may think you’re on a “fixed income” but when someone treats you to dinner, is that not a bonus? If you give your last twenty dollars to someone in need, will you not receive a blessing ten fold? How much more may we give in love? God always provides. We ask and we will receive. Why not share what is given us with those who truly need? Much of our time is put into being comfortable. It’s not a sin to be comfortable but what if we spent as much time to think outside of this earthly mold? Today, challenge yourself to think with God’s eternal perspective. What does your room look like in heaven? Dream God sized dreams. Pray for his direction to take you out of your comfort chair today, to negate our “feelings” and say hello to conviction and repetition of God’s love. Like waves that hit the shores, I pray that you will spread the news of compassion, that you will see that there are lives outside of our immediate family who want to be loved. Will you get out of that chair for 25 repetitions…people who may need help? But first, spend time with God. Make that the first repetition for the day. Pray for his guidance, with thanksgiving because love never fails. Will you take that challenge to get uncomfortable today? If you do, I want to hear from you. I’m thankful for this shake-up and I pray that we may join together to show compassion. I pray that all lives matter and that we may come together to know what is true….to show love and compassion. Lets be agents for change. Hi, My name is Summer and I am a Christian Warrior. Who are you? Comment here with solutions….I am not enough but together, we may have solutions. A little over a year ago, my beloved rooster, Thurston had been protecting his flock when he was attacked by the infamous chicken hawk. For three months I bathed him…in Bill’s bathtub. (Don’t worry! I cleaned it after each time. Trust me, that bathtub was cleaner than your bathtub on its best day! Yes, it was! And, that is a great husband who allows those kinds of shenanigans!) I even used my blow dryer to dry his feathers. He loved the warm flow of air and he’d coo. I treated his wounds with the necessary ointments and antibiotics. During the day, he stayed on our enclosed porch. (I cleaned that everyday, too!) He spent his nights in a crate in our laundry room. (Just so you know, I cleaned that everyday. Sheesh!) He was well cared for while he was sick. Thurston would get better but then would reopen his wounds, as he would start to heal. It was so frustrating. To protect himself…from himself, I made a “cone of shame” for him. With this contraption around his neck, he wasn’t supposed to be able to reach his wounds. That worked for a while, but then the foam cone started to irritate his neck and it had to be removed. Eventually, he developed an infection. There was nothing I could do to make it better. Before he was put down, he actually came to the front porch and stood on the steps near where I was sitting and cooed at me. Running inside the house, I couldn’t stop crying…over a chicken! Tired yet excited from our chicken swap experience, we stopped to pick up lunch on the way home. It wasn’t until we had the fried chicken in the car that I looked at Bill with the look of horror as they then rode in the backseat. (Maybe “those men” were right.) It just felt wrong. Having little living creatures to care for is not for the faint at heart. There’s loss because of other creatures and there’s the cleaning aspect. Oh, that’s not my favorite part of having chickens but I do it. Summertime is particularly difficult as the smell of chicken poo is at its full glory! Wow. It can be quite the experience. In fact, I was out cleaning on one particular day with my bucket and shovel inside the rather large coop that my sweet husband built for me. He was outside blowing leaves and didn’t know I was inside the coop but somehow noticed the latch outside wasn’t locked. He locked it and went about his chore of leaf blowing. (That machine is loud y’all!) I turned to open the door and to my dismay, I couldn’t. Looking out the beautiful antique window with chicken wire on it, I see Bill and begin screaming through the screen! (Imagine a man with earphones as he listens to his favorite music with a leaf blower while a woman in a chicken coop tries to get out of the tiny chicken door. Imagine her as she stares at a window that is covered with chicken wire and also only opens halfway. It was not calm, dear friend!) Finally, after about thirty minutes of looking for a way out, I imagined that the chickens were definitely safe at night. I also imagined ways I would punish Bill, if he ever figured out that I was missing. Then it happened. He eyes me from across the yard as I was jumping up and down in the window. I’ll let you figure out what happened next. The good news is that there was actually side splitting laughing on both of our parts! It’s part of my marriage that I love the most! It wasn’t until we attended the largest Chicken Swap I’d ever encountered in May that I considered more chicks. (Remember I said this was Bill’s idea!) This farm only hosts this event two times a year where they invite others from all over to visit their farm. They have every kind of animal you’d see on a farm that visitors could buy or trade. I mean there is an ark of a selection there! Walking every aisle at the swap, I found him. He was lying on his back in the arms of the owner as she rubbed his stomach. (I couldn’t believe it either! I mean, who doesn’t like a good belly rub?) Every other chicken in the place was between ten dollars to fifteen. This little man was thirty-five. His breed wasn’t rare, but his color was. He came as a second generation from a famous farm. (Bill mouthed the words “rare” and “Gucci bird”, etc.) As soon as I held him, I wanted him. As soon as Bill saw me holding him, he asked how much for two birds because this rooster couldn’t be alone as we were raising him! And, well he knows me too well! We got two birds. We’ll swing by to pick them up as we try to find a box to put them in. We named him Beau. It just seemed natural! The hen became know as Henrietta. That seemed equally as natural! After they’d grown big enough to blend with the rest of the flock, they stuck together like glue. Beau is not as large as Thurston was. They are the same Wyandotte breed. That said, maybe he’ll grow in the next year. Only time will tell his story, or I will relay it to you as it progresses! Months later, I allowed the flock to free range. They typically will stay pretty close together. They don’t leave the property. During the day, the only predators are usually just hawks and dogs. On one such day, I stayed outside raking and cleaning while they were out running the property. I heard an unusual SQWACK! Slowly I turned, step-by-step, inch-by-inch and then into a run toward a man who had SaraAnne underneath his arm. He had jumped a four-foot fence, walked at least twenty feet and snatched up my beautiful white hen. Before he had a chance to get back over the fence, I tapped him on the shoulder and asked his intention. Needless to say, I grabbed her from him and informed him that I was taking back my SaraAnne. He looked to the left and right and I wasn’t sure of his next move and then he turned and left. By the urging of my neighbor, I called the police. Thankfully, he was a kind officer. He was a chicken owner as well, so he understood. His belief was that this chicken thief left because he saw the black SUV with state plates. The police officer said I was lucky. He asked why I confronted him and grabbed the chicken. In my mind, that guy was lucky…no one takes my pet I’ve never given consent for a play date for any one of them, by the way. Like a deer in headlights, I said no. She seemed confused. My heart was saying yes, but my husband’s answer came out of my mouth. All the way home with two babies in the floorboard of my car, I kept thinking of how to explain this to Bill. Driving home, I called my sister to get her help and she confirmed that I was in trouble. I pulled into our long driveway that seemed like it was longer that day than it ever had been! As usual, Bill came out of the house. (He always helps me with groceries, etc. every time so I knew he’d be there. Now what?) I hushed the chicks. Bill immediately started getting the feed out and “peep…peeep”. Several weeks later and I was again at the feed store. My favorite breeds of chicks were there that day. I got what I needed and left to go home. I was so proud of myself until I found the car driving back to take one last look at the chicks. Next, “peeep peeeeeeep” was heard in the floorboard of my car. I justified this because I knew my husband would (1) not be home before me that day and (2) wouldn’t be able to determine two more sets of peeps before he left town the next day! Hurried, I placed the other box on its side next to the other box in the bathtub upstairs. I got the larger water container along with the other large feeder. It was set and Bill wasn’t home. Free and clear, or so I thought. Whew! He was gone. I was cleaning the tub all by myself as they ran the length of the bathroom and my phone rang. It was Bill. He calls to tell me his status on the road. He then said some other things that had me baffled. You know, last night your chicks were making quite the ruckus last night. I decided I’d better go check on them. Yeah, and you know what? They multiplied! Yeah, and you know what else? They have quite the skills because they’ve built another condo, too! Yeah. You don’t know anything about this, do you? I know that it takes 21 days for an egg at optimum temperature to hatch. Those two that are up there aren’t even old enough to have eggs! Hmmmm….This is a true mystery then. Insert continuous laughing by both of us! I had tears in my eyes. I’m so grateful to be married to this man. Any other man would have run for the hills long ago. I don’t know that he hasn’t thought about it, but I’m thankful he’s still here! Since this is true. I must be really valuable! I’m truly grateful that God is in control. I’m more thankful that God loves you and me more than I could actually love these beautiful fuzzy little creatures. THAT is love. You are loved. You are worthy. Claim that truth for yourself today! I know I will. Until next time….Let me know if you have name suggestions for these two chicks! It’s spring…kind of…and I’m thinking of the birds and the bees. We already have the birds, specifically the chickens, but we have no bees. We have fresh “free”eggs and wouldn’t it would be great to have fresh honey, too? Thurston, the rooster is on my enclosed porch as he’s healing from a hawk attack. He was just doing his job to protect his ladies and BAM! He was scooped up and fought his way out of the talons of a bully chicken hawk. 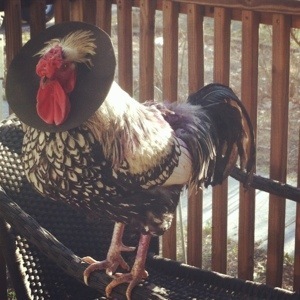 He’s now wearing a (custom made by moi) cone of shame to deter him from pecking himself to death. So yesterday I went back to my second home, aka the feed store, to get medicine and food. (Just a reminder to those thinking of getting chickens for “free eggs”…there’s no such thing as “free”!) Since I knew what I needed I went directly to the order counter and paid for the goods. I can’t believe I was able to walk away from then but sometimes you have to know your limits. I mean, they weren’t the kind of chickens I really liked so that helped! The saleswoman who knew me hollered as I was leaving the building. “We’ll, since you’re not doing the bee hive…”. When my mother died. I was in my early twenties. She blanketed my fears. She encouraged me. She made all things pretty. If I made mistakes, she talked me through them. We were a team. But, then…she was gone. After graduating from college I thought I’d get married like all of my friends. I didn’t. When I finally met my soul mate, I was 33. I thought we’d have children. We couldn’t. As life progressed, I thought we’d expand our family but it didn’t happen like I’d dreamed. We had so much love to give. Why wasn’t this happening? I was told I was so talented. Why was my life not like the fairytales like those of my friends? I would compare myself to them…2, 3 and 4 kids. I had “nothing”, or so I thought. I had faith in God. He says “Take courage…”. My mother always reminded me of this. Now…it had meaning. It had meaning to me. I’m taking control of my life…finally. (I’m a late learner, but I’m thankful to be able to learn!) I’m taking the courage afforded to me by my faith in God. I just had to believe in Him…and and then I asked Him. Without trying…without caring…without loving…without faith, what is this life? Life may not happen as we imagined it; but isn’t it more important to have faith, hope and love? In fact, fear is actually “False Evidence Appearing Real”. Do you take courage? What did you do that required courage? If not, what will you do to receive your courage and conquer your fear? You don’t have to win everything to have courage. Tired from work, I was in auto mode when getting home. 5) Put chickens in coop. Shocked by this, I thought, it had to be our beagle-Lucy who had shredded the tube of Preparation H. She was known to get into stuff, specifically food, when left alone. Panicked I called the poison control center for children. There was that stifled laugh again….After she contained herself, she gave me the number to a poison control center for dogs. I called. They needed my credit card number before they could speak to me. Although I understood, I tried to ask the question quickly…thinking they’d heard this before now and maybe she’d have a quick response. (Because of her snickering on the phone, I began to think the girl from the children’s poison control line was pranking me!) No such luck in getting help for free, so I just hung up and looked for Plan C.
Plan C: I knew my friend Pat had dogs…lots of ’em! She’ll know what to do. After her uncontrollable laughter…and after explaining that the Preparation H wasn’t mine, she agreed to call her friend Bart, who was a Vet. Bart needs the ingredients for Preparation H.
Pat could not stop laughing. Lucy followed me through the house just panting and carrying on as if she was about to get a treat. It really didn’t seem life threatening, but I didn’t want to wait and see what might happen if I didn’t act to find a solution. Just after hanging up the phone, Pat rang me back since she’d spoken to Bart again. It turns out, his wife was pregnant and he found a tube of it “on his ‘wife’s’ nightstand”. Bart tells Pat to feed Lucy some rice. That would help bind her. He advised that this medication, if eaten could cause vomiting and diarrhea. We immediately got the rice going. (Lucy was so happy. I could have sworn she was smiling!) We babied her. We loved on her. She even got the choice spot in our bed. She could not have been happier. With four dogs, Lucy was the rival of the other dogs. They stared and wondered what they needed to do to deserve this kind of royal treatment. It was 2 a.m. Lucy was laying on her back with all four legs in the air. She was in heaven. At 2:15 a.m I heard a dog trying to hurl. It didn’t sound like it was coming from the bed…It wasn’t Lucy. In the end, it was our dog Bud…old faithful. He was 10 years old. He never got into anything when we were away from home. This time, he got into some Preparation H. Who knew why?! So, in the end, we learned that even an old dog may have a few new tricks up his sleeve! It wasn’t my tube of Preparation H! (Maybe it was…) Do you believe this? Has anything like this happened to you? I’d love to hear about it. Leave me a note! I knew this was a place where if you had an extra rooster or you needed or wanted a goat, you could find one. The kid said if we took the rooster and the hen that we could borrow his crate for a week. As they fell asleep in my arms, I gazed at my husband and $30.00 later, we were carrying them to the truck. On the way home, we were hungry so we stopped for fried chicken. I felt so guilty. We nervously laughed as we carried the fried “cousins” in the front seat while the 3 month old chicks were passengers in the back. Over lunch, we concluded our need for a small coop. Back to the “Swap” we went to get the $300.00 coop for up to 6 chickens. That would be plenty of room, or so we thought. My husband tells his fellow workers of our new additions to which one man tells him, “that rooster’s gonna’ kill that chick! You need more than one chick!” He calls me and says we better get a few more chicks, so I called to do just that. That evening in the rain, we chased them all from the woods into our newly cramped coop. 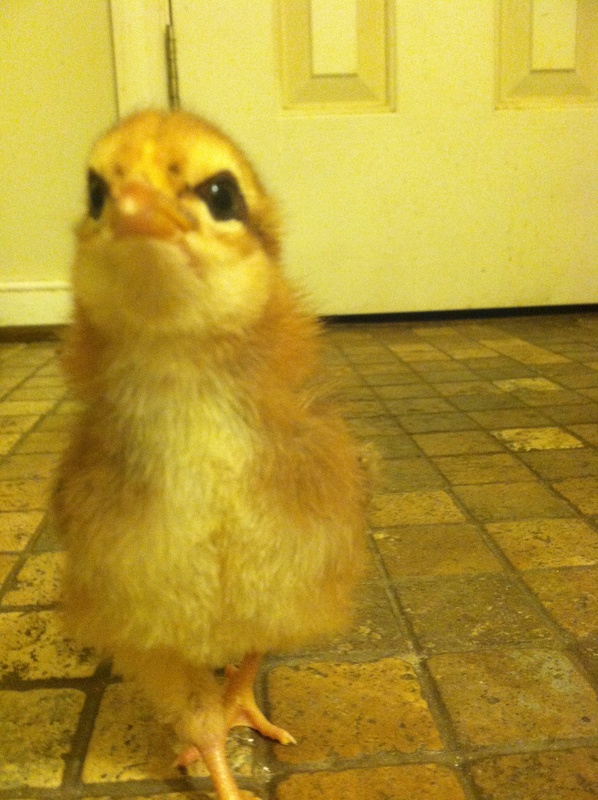 (By the way, our “free”chick, named “JudEE”, has a hunchback. She’s no different but she does squawk and walk a bit sideways.) I’ve never been more soaked then I was after that little adventure. Springtime came along and baby chicks were for sale at the local hardware store. I couldn’t resist. We had to buy in quantities of 6! I then had to buy a lamp and well, they couldn’t be outside! The hubby sacrificed his bathroom and they were soon flying and pooping everywhere! I do mean everywhere, so I bought 6 more. It just made sense, to me. The more the merrier. So, we built a coop for all 24 chickens! When I say “we”, I mean my loving husband aka domestic associate! That is love. He never said “no”. He loves my love of animals and he doesn’t even like eggs! Thank God, my neighbors do! And, in time, I let them all out to roam the property or “free range. It was like a movie with all of these chickens of many colors out in the open. The trees were offering a glimpse of green. Ahhhh, I was in heaven. I took pictures and posted them everywhere! Then, I started counting. Stupid chicken hawks took out 2 of our chicks. The following day, I came across two more limp bodies in the forest. It broke my heart. I dug graves for them and made little crosses to mark the spot. I sobbed while burying them. A few days later all of the remaining chicks went to the gravesite and took their dirt baths. It was surreal and sad. And this was a daily ritual for days after that. It wasn’t until a week or so later that I learned we’d had a grave robber! They were gone. I didn’t dig the hole deep enough, apparently. Interestingly enough, they didn’t discuss any of this “National Geographic” reality of nature in my “Chickens 101” class. And this was just the beginning. That being said, the chick’s are coming to a local store next week. Will you be getting some? Do you think I’ll be getting more? Stay tuned.